Top seed Stefanos Tsitsipas of Greece reached the Open 13 Provence final in Marseille with a 7-6 (7-1) 6-2 victory over Belgian third seed David Goffin. The 20-year-old, who beat Roger Federer en route to the Australian Open semi-finals, was twice broken in the first set but raced through the tie-break. The world number 12 won eight of the last 10 games to triumph in 69 minutes. In Sunday's final he will play world number 50 Mikhail Kukushkin, who beat French wildcard Ugo Humbert 6-4 6-4. 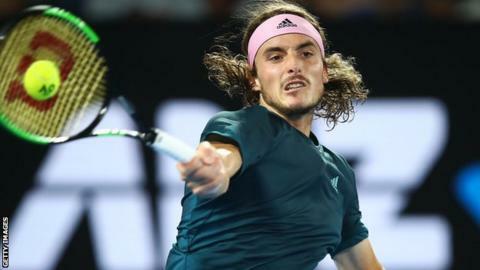 Tsitsipas, who became the first Greek player to win an ATP World Tour title when he claimed the Stockholm Open in October, beat the Kazakh in three sets at last year's Dubai Duty Free Tennis Championships. Kukushkin won his only ATP Tour title at the 2010 St Petersburg Open and reached his fourth ATP final with victory over Humbert in one hour and 33 minutes.